Spices have been traditionally used medicinally for centuries with knowledge handed down generation by generation. They didn’t need scientific studies to know these natural plants worked, they just did. Each plant, seeds, berry and root containing multiple medicinal compounds and oils that exhibit anti-inflammatory, analgesic, antioxidant, anti-microbial and anti-allergy action (plus many more!) Now with the addition of science, these medicinal spices are getting the attention they have long deserved. There are many complex flavour notes of all spices and pairing and using them in the kitchen can be a little overwhelming. But surely with just the right amount of information about some common spices, we could all become spice merchants of our own kitchen. Not only creating flavour-sensation meals, but also benefiting from the health benefits of medicinal oils contained in each spice. We will share with you four unique spices, their medicinal properties, flavour notes and some tips on using them in day to day cooking. 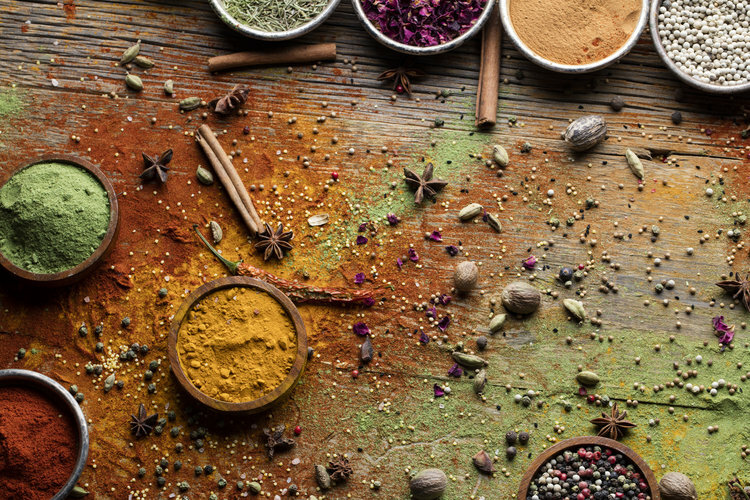 NB: Even though Turmeric is an incredible medicinal spice, we want to explore some spices that are lesser known and used. Native to southern Europe, Turkey and the Middle East, Nigella has been cultivated for over 3000 years. It is said to be called “seed of blessing” and “a remedy for all diseases except death” (1). Nigella seeds have a mild heat and slightly bitter taste with a mix of herb and charred onion-like flavour. To get the most flavour out of the seeds, try grinding and then dry-roasting them to release the oils. Nutritional composition of Nigella seeds have shown high levels of fatty acids, protein, potassium and iron (2), with many promising studies showing potent anti-oxidant effects as well as Nigella’s role in reducing blood glucose and regulating insulin levels in Type 2 diabetes (3). For culinary use’s, Nigella is great for flavouring rice or pulses by lightly frying in ghee/olive oil before hand. You can also use Nigella seeds in lamb dishes such as lamb tagine or sprinkle over roasted root vegetables and eggplant. Native to Java, Indonesia, Galangal is a plant belonging to the ginger family. Scientific studies on galangal and the plants unique properties have shown it to exhibit high antioxidant, anti-inflammatory and analgesic effects (4). Studies on the oil extracts of the rhizome, notably Cineole, have shown potent anti-microbial effects on the bacteria Staphylococcus aureus, Klebsiella pneumonia and Escherichia coli (4). Described as ‘warm, pungent and peppery’, fresh galangal is best grated or pounded to a paste to release the oils and more flavour (1). Match with accompanying spices such as bay leaf, coriander, cinnamon or dill. Try galangal grated on fruit with a squeeze of lime, add to smoothies or vegetables juices instead of ginger or make a paste and add as a base to slow cooked meat dishes such as beef redang. Lemon myrtle has long been prized by the Australian aboriginals who use it in cooking and for treating cuts. Native to Australia, it is now found also in Malaysia and China (1). Described as “more lemony than lemon, with green herbal notes and a subtle eucalyptus”, lemon myrtle is concentrated in a lemon-scented compound called Citral (1). A 2010 research study on the antimicrobial effects of citral concluded it was effective against Methicillin-resistant Staphylococcus aureus (MRSA) (5). MRSA is a gram-positive bacteria that can sometimes be highly antibiotic resistant and is very hard to treat. Pair this lemony delight with spices such as lemongrass, cinnamon, black pepper or bay leaf. Infuse lemon myrtle in olive oil with a touch of garlic or try adding it to roast vegetables, oily fish or lamb. Juniper berries, maybe best known to some as a main botanical in gin, but these berries have many more medicinal and culinary use’s. Native to the temperate regions of Europe, Russia, North America and Japan, Juniper has a ‘sweet taste, with strong aroma’s of pine and citrus’ (1). Pinene, a compound found in juniper berries has been researched for it’s anti-microbial effects with a 2012 study showing positive effects of pinene on the fungus Candidia Albicans (6). The study concluded that pinene is effective against C.albicans and more notably, it’s antimicrobial effects against biofilm formation of this fungus (6). Partner this medicinal berry with cabbage or beetroot in a slaw or before roasting, use the crushed berries as an ingredient in a marinade for salmon or meat or even pair with chocolate in a truffle or cake mixture. This entry was posted in Health Recipes, Health Supplements, Organic Food, organic recipes, Vive Clinic, Vive Health Nutrition, Well-being and tagged bush medicine, cooking with galangal, cooking with juniper, cooking with lemon myrtle, cooking with medicinal herbs, cooking with nigella, culinary uses for herbs, food is medicine, galangal, holistic healing, juniper, lemon myrtle, medicinal herbs, native australian medicinal herbs, naturopathic, nigella seeds. Bookmark the permalink.